A branch of Clemson University’s Department of Public Safety, the school’s Fire and Emergency Medical Services, helps create a safe campus environment for students, faculty, staff and visitors. 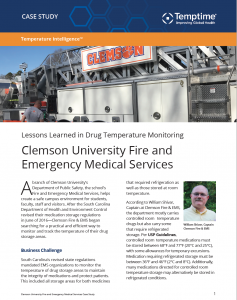 After the South Carolina Department of Health and Environment Control revised their medication storage regulations in June of 2016 – Clemson Fire & EMS began searching for a practical and efficient way to monitor and track the temperature of their drug storage areas. South Carolina’s revised state regulations mandated EMS organizations to monitor the temperature of drug storage areas to maintain the integrity of medications and protect patients. This included all storage areas for both medicines that required refrigeration as well as those stored at room temperature. 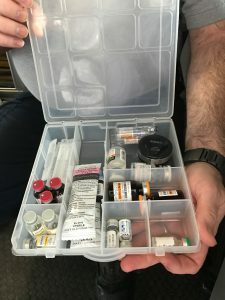 According to William Shivar, Captain at Clemson Fire & EMS, the department mostly carries controlled room temperature drugs but also carry some that require refrigerated storage. Per USP Guidelines, controlled room temperature medications must be stored between 68°F and 77°F (20°C and 25°C), with some allowances for temporary excursions. Medication requiring refrigerated storage must be between 36°F and 46°F (2°C and 8°C). Additionally, many medications directed for controlled room temperature storage may alternatively be stored in refrigerated conditions. The state regulation requires that controlled room temperature medications be monitored and stored in a temperature range that doesn’t fall below 20°F (-7°C) and doesn’t exceed 100°F (38°C). If temperatures fall outside of these extremes, the medication must be discarded. You can read more about USP guidelines for EMS accreditation in Temptime’s VUEPOINT Knowledge Center. Prior to implementation of the new regulation Mr. Shivar researched online to find out which solutions could provide efficient mobile temperature monitoring for use in their three Clemson Fire & EMS ambulances. “There were a lot of temperature monitoring methods to consider, so we thought our best course of action would be to seek guidance from a company who specializes in monitoring the temperature of pharmaceuticals.” That’s when he noticed that the refrigerated drug shipments they were receiving from their distributor included a temperature monitoring card – Temptime’s TransTracker® CF. Originally they thought the TransTracker CF, which gives a visual cue if a package has been exposed to excessive heat or temperatures below freezing, might be the right solution, so Mr. Shivar contacted Temptime for more information. That’s when Temptime started talking to him about their EDGETM wireless Bluetooth®-enabled sensors, which were a much better fit for Clemson’s needs. The EDGE family of sensors are easily programmable and allow you to customize each device to your specific monitoring needs. They can accurately monitor the temperature of medications and medical devices to help ensure their efficacy whether on the move or in storage by providing alerts in case of exposure to extreme temperatures. The devices record and store data that can be viewed, downloaded and shared using the EDGEVueTM mobile app. This data is stored on the EDGECloudTM, which can be viewed and monitored via the EDGEVue Web App dashboard. This web app also allows for reporting to perform analysis or for regulatory or accreditation requirements. 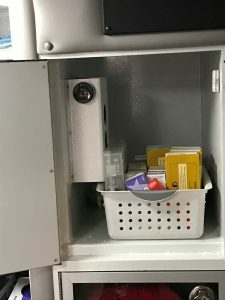 Clemson Fire & EMS began testing with four EDGE M-300 devices – one for each of the medication storage cabinets in their ambulances (since this is the location they felt would be most susceptible to extreme temperatures) as well as one for monitoring temperature in their bay. The EDGE M-300 is a small, reusable device with a replaceable battery that can be placed anywhere medication is stored. This can range from refrigerators, to drug boxes, to medic bags and more. It measures temperatures between -40°F to 185°F (-40°C to 85°C) with a high degree of accuracy. 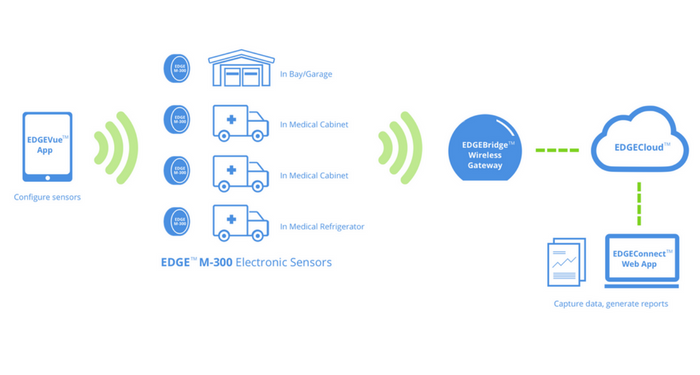 Photo(s): EDGE M-300 Wireless Sensors in ambulance medication cabinet (left) and container (right). “Once we began looking at the data, we realized we needed to expand our testing to include monitoring in other locations – so we moved a sensor into one of the on-board mini-refrigerators,” says Mr. Shivar. They initially programmed the EDGE M-300s to collect data every 10 minutes. They considered the state temperature regulations when setting the high and low alarm limits but decided to be more conservative in order to provide for early warning to medications going out of range as well as incorporating their understanding of the more stringent USP Guidelines. Mr. Shivar would download the data and review the findings provided by each device on a weekly basis. Their goal during the first year of monitoring was to gain insight to temperature exposures over the course of several seasons. And they learned a lot more than they thought they would. “First and foremost, we realized that when the mini-refrigerators weren’t being powered by an inverter the temperatures were not stable,” Mr. Shivar explains. They then tested coolers with reusable ice packs to see if that worked better, but the result was the same – the temperature did not remain in a stable range for a full 24-hour period. Clemson Fire & EMS ultimately decided to purchase coolers that can be plugged into an AC or DC power source for regulating temperatures and now use those over on-board mini-refrigerators. While temperatures outside reached 100°F (38°C) for several days in a row – temperatures in the bay did not reach that level for any extended period of time (Bay-Garage). Drugs on the shelves in the ambulance (Medic 3) also didn’t exceed 100°F (38°C), but they did get much warmer than expected and took several hours to cool off once the ambulance returned to the bay. What they learned is that even if the ambient temperature in the bay is not too hot, the temperature inside the ambulance where the medication is stored is susceptible to outside temperatures. Therefore, even if the bay is temperature-controlled, it may provide a false sense of confidence that the medication will not be negatively impacted by temperature. The data they gathered also helped Clemson Fire & EMS make the decision to purchase a new ambulance where air conditioning or heat will kick on 24/7 as needed to stabilize and maintain temperatures. This ambulance also has a thermoelectric cooler that can be powered by AC or DC power running at all times to protect the integrity of the drugs requiring refrigerated storage. Their goal is to upgrade all of their ambulances to these newer models eventually. “We’d been thinking about moving to this new technology for a while – and what we learned from monitoring temperatures with the EDGE M-300 made the decision that much easier for us,” Mr. Shivar says. In the meantime, Clemson Fire & EMS has entered a second stage of testing in which they have included a remote fire station and additional monitoring applications. They’ve decided to focus on monitoring one remote ambulance very closely using three EDGE M-300 devices – one stays in the bay while one is in the ambulance’s patient compartment and another is in the ambulance’s cooler. The purpose of all the testing, says Mr. Shivar, is to pinpoint temperature exposures and see what opportunities exist for making further process improvements. Their ultimate goal with the testing, in addition to conducting continued monitoring, is to protect the drugs they use to provide the safest patient care possible and reduce waste. The biggest benefit came when they installed the EDGEBridgeTM Wireless Gateway in the bay to automatically download data whenever an EDGE device came in range. “This has really saved us a lot of time since now whenever the ambulance pulls into the bay the data is automatically uploaded to the cloud,” Mr. Shivar says. “Before, I had to manually download the data for each ambulance. Now it’s done automatically, and all I have to do is log into the EDGEVue app online to see all the most current information that’s been gathered.” Plus, using the EDGEBridge means the team gets automatic alerts when temperatures are out of range. Use of the EDGE M-300, EDGEVue App and EDGEBridge to test actual in-use conditions has given Clemson Fire & EMS the insight they were looking for to make adjustments to their processes and equipment to better fulfill their mission. The EDGE monitoring system provides continued temperature monitoring, including alarms when temperatures are out of range, to reduce drug waste due to extreme temperature exposure. It also provides confidence that they can deliver the safest patient care with medication that has not been exposed to potentially damaging temperatures. The Fire and Emergency Medical Services is a branch of Clemson University’s Department of Public Safety within the Division of Student Affairs. Fire & EMS is dedicated to providing a safe campus environment for faculty, staff, students, and visitors . Their primary response area is the main campus of Clemson University . They also provide contracted Fire Suppression response to the City of Clemson geographically adjoining and nearly encompassing the University campus. Their mission is to protect life, property and the environment through rapid efficient emergency response, proactive code enforcement, modern fire prevention methods and progressive public education on fire and life safety issues. Temptime offers a comprehensive range of temperature monitoring solutions to address the cold chain needs of pharmaceutical and medical device manufacturers, hospitals, blood banks, mail-order pharmacies and EMS providers. Customers use their chemical and electronic devices to monitor the storage and handling of medical products that improve and save lives. The company’s mission is to provide the tools and knowledge necessary to accurately monitor drug products and ensure that they have not been exposed to temperature events that could impact their effectiveness in treating patients. Temptime’s products include low cost, chemically-based heat indicators and freeze indicators for application to blood products, vaccines, sensitive biologics, and other medications. Their sophisticated electronic EDGE wireless temperature and humidity monitoring systems are equipped with low-energy Bluetooth® technology for cloud-based data storage and sharing, leveraging mobile technology.